Remember back when these malls only had Super Nintendos? The announcement of Pokémon Let’s Go Pikachu and Let’s Go Eevee resulted in a mixed bag of emotions. There are Pokémon fans who hate Pokémon Go, Pokémon fans who hate the nostalgia trip of the original 151 Pokémon and would rather have a completely new and core Pokémon experience, and Pokémon fans who seemingly outgrew the formula and are upset to see what’s essentially “baby’s first RPG” made even more simple. Here’s the funny thing — it doesn’t matter what side of the spectrum you’re on. The game is actually pretty damn good. 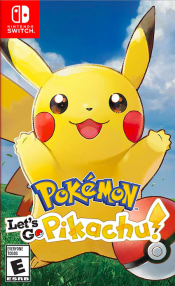 Pokémon Let’s Go Pikachu and Let’s Go Eevee are essentially remakes of Pokémon Yellow. The game takes place entirely in the Kanto region but you don’t have the usual choice of Bulbasaur, Charmander, or Squirtle as your starting Pokémon. You get either Eevee or Pikachu, depending on which version of the game you play. It’s also worth mentioning that while your journey starts off in Pallet Town, you’re not using Red. You’re using an entirely new character with his or her own rival (and no, he isn’t Blue). And like Pokémon Yellow, your partner Pokémon follows you around, except now they’re on your head. In addition to having Pikachu or Eevee on your head, you can also have any of your other Pokémon follow you around or give you a ride. For example, if you have a big flying Pokémon like an Aerodactyl or Charizard, you can ride it during your travels. The same goes for an Onix and a slew of others. If you have a smaller Pokémon, they can look around and find items for you. It’s charming stuff. 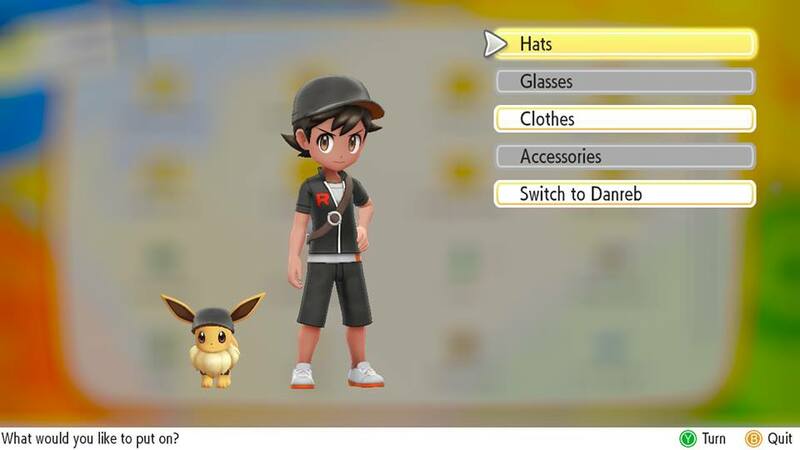 Playing dress up is one of the many charming things you can do in Pokémon Let’s Go. In regards to what the plot revolves around, again, it’s Pokémon Yellow. Together with your Pokémon, it’s all about becoming the very best. That can mean anything–whether it’s catching every Pokémon and filling up your Pokédex, or collecting all eight gym badges in the region and beating the Elite Four to become the Pokémon League Champion–being the very best at whatever it is you want is the goal. Nintendo is making a big deal about the fact that you can play the game with a single joy-con, and while that’s cool, it’s far from the best way to enjoy the game. I enjoyed most of the journey playing in handheld mode. Not only has it been the (only) way to enjoy mainline Pokémon games in the past, it’s also the method I feel gives you most control. Released with Pokémon Let’s Go is the PokéBall Plus controller, which is essentially a Joy-Con in the shape of a PokéBall. It’s an impressive and surprising intuitive little gadget. The button at the center of the ball is a actually a button in addition to a joystick, while squeezing on the red or white halves of the ball also serves as the counter button press. Throwing the PokéBall Plus at a Pokémon simulates the act of attempting to catch a Pokémon and, for some reason or another, it’s actually more accurate than using the Joy-Con. At the end of the day, the PokéBall Plus is a gimmicky toy, but there’s a certain charm about it that’ll make it irresistible to diehard Pokémaniacs, and the fact that the legendary Pokémon Mew is also bundled in the ball make it that much more desirable. The fact that you can use a single joy-con (or PokéBall) is a nice touch, but when it comes to catching Pokémon, I’ve been more prone to misfire on my throws, which is essential since catching Pokémon is completely Pokémon Go-inspired. Unless you’re up against a Snorlax or a legendary Pokémon, you won’t be battling any wild Pokémon. You only have the option of using berries you’ll come across in the game to make it easier to catch them as well as simply throwing whatever form of PokéBall you have. You have the option of using motion controls with a Joy-Con or simply tapping on the confirm button with good timing (which leads to less wasted balls). The difficulty of a catch is determined by a ring that’s put around the wild Pokémon. Green means it’s an easier catch, while red means it’s a more difficult catch. As in games past, Great and Ultra Balls make the act of catching a Pokémon even easier — or so we think. The only time you actually fight Pokémon in Pokémon Let’s Go is when they’re Legendary. Here’s Mewtwo. The reason I question this is because it’s almost impossible to tell how much easier (or harder) it is to catch a Pokémon. There were multiple times I’ve thrown a PokéBall at a red-ringed Pokémon only to have it easily done, while the amount of times I’ve thrown an Ultra Ball at a yellow-ringed Pokémon resulted in no luck. If I didn’t know better, I’d say everything were completely random. It’s no secret that the Pokémon Go approach to catching wild Pokémon was a little controversial, but two things were done to help alleviate that. For one, every time you catch a Pokémon, your entire party (of up to six active Pokémon) gains experience points. This makes the whole experience less grindy. At that, trainer battles retain the traditional turn-based battle system with the only caveat being the fact that Pokémon can’t hold items. That’ll come off as a bit of a letdown to some, but I personally was never a fan of the item-holding anyway, so I could do without that depth. There are plenty of trainers to go around. Whether they’re just people you come across along your journey, gym leaders, the Elite Four, or certain specialists that’ll come up post-game, they’re all over the place and it wouldn’t be out of the ordinary for players to find that the Pokémon Go catching mechanics in combination with the traditional battle system complement each other very well. Fighting trainers to take a break from catching Pokémon and doing vice versa totally work. The best thing about these changes is it totally streamlines the system. Pokémon Let’s Go got rid of random encounters, so now you can see Pokémon pop up and appear in tall grass and dungeons at any time. Not only does this finally give you the ability to focus on catching specific creatures you want, you can also easily avoid Pokémon to finish a dungeon much more quickly than you would in the previous games. Mt. Moon, the first “dungeon” in the game, usually took at least an hour to get through. In Pokémon Let’s Go, you can probably do it in 15 minutes if you decided not to mess with any Zubats wild Pokémon in the cave. It’s the quality of life stuff that really make Pokémon Let’s Go shine. If you’re a longtime fan of the series but haven’t played any of the latest iterations, HMs (hidden machines that taught your Pokémon moves that you can use outside of battle) are no longer a thing and have been replaced by hidden abilities, which easily streamline the experience. And perhaps the best change comes in the form of no longer needing a PC to manage your stored Pokémon. If you’re unfamiliar with the system, you can only carry up to six Pokémon in your party. All the other ones you catch end up sent to a PC (we’re assuming over the cloud) that you can access at any Pokémon Center in the game. 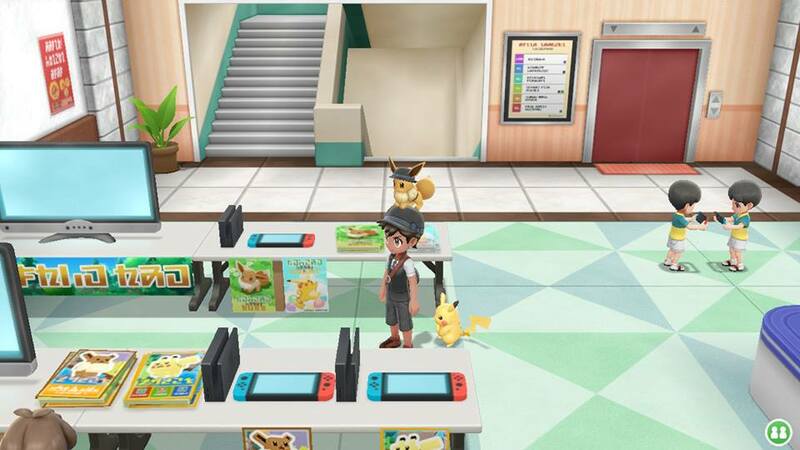 Pokémon Let’s Go does away with that, and you can manage your Pokémon box operations at any point in the game. There’s going to be a bunch of people who’ll discredit Pokémon Let’s Go and say it’s not a full-on authentic Pokémon experience. That couldn’t be farther from the truth. Pokémon Let’s Go feels like almost any other mainline Pokémon game. 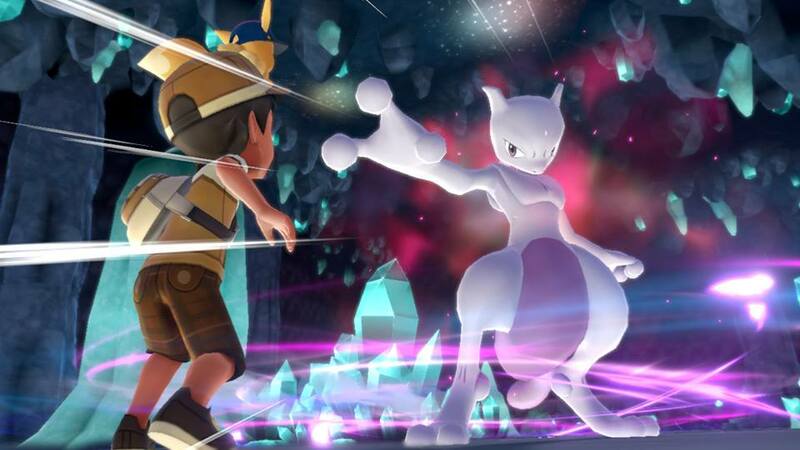 Sure, the experience of catching Pokémon is there primarily for the Pokémon Go players (especially since you can also bring your Pokémon from Pokémon Go into Pokémon Let’s Go once you reach Fuschia City), but just about everything else is as Pokémon as it comes in a much more streamlined way that’s simply more appropriate for today’s RPG standards. In fact, Pokémon Let’s Go is as deep as Pokémon games come. I haven’t even talked about the new meta that makes catching Pokémon with better stats or shiny Pokémon much easier, which is done by catching Pokémon of the same species in succession to create a catch combo. Once you catch at least 31 of the same Pokémon in a row, the probabilities of getting a “shiny” or a Pokémon with superior stats is much higher. If you don’t want to put that much detail in your journey, you definitely don’t need to. With another all-new Pokémon experience coming to the Switch this time next year, Pokémon Let’s Go will do more than just satiate the wait especially if you’re starting for another Switch title to enjoy before Super Smash Bros. Ultimate. Editor’s Note: We made a slight change in copy because we failed to point out that the button at the center of the PokéBall Plus was also a joystick. While it could be assumed because of player movement, we just wanted to make sure the facts were straight. Both Pokémon Let's Go Pikachu and Pokémon Let's Go Eevee were purchased by the reviewer and played to completion before starting on this review.